The Stand Steady Winston Workstation Dual Monitor Mount Sit-Stand Desk Converter is a sleek, modern, and minimalist way to stand while you work. 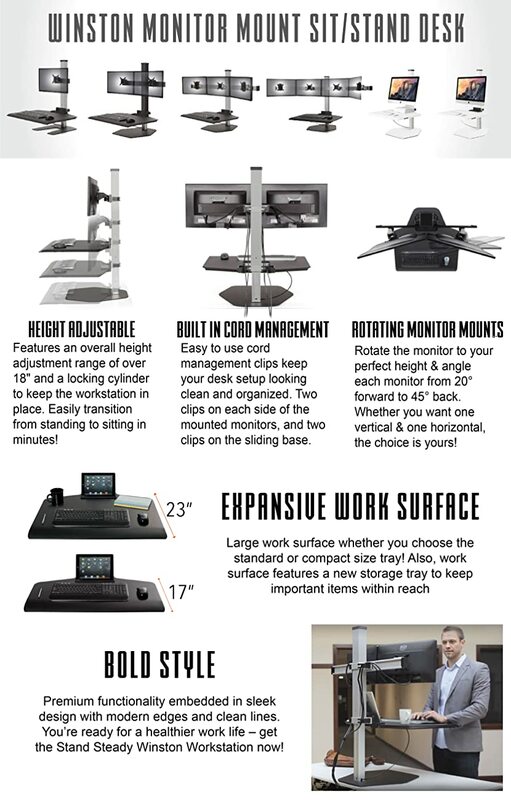 If you want a standing desk converter that takes up very little space while providing perfect monitor placement, this is the one for you! One employee order this Standing Desk then everyone wanted one! We've ordered several and everyone loves them so far. They are very easy to change from sitting to standing. I hope to get one for myself soon. The standing desk has changed my life. It was easy to assemble and operate. The ability to stand and work during the day has helped to eliminate the mid-afternoon drowsiness. I find my energy level is much higher during the day. When speaking with client's, the ability to stand during calls/web presentations is very helpful. I no longer have back or neck soreness at the end of the day. I like it a lot, easy to go up and down, monitors tilt in and out very nicely, the sloped-edge to the platform makes typing way more comfortable when you are sitting versus the Victor DC350 High Rise (which I returned) that does not slope. Screens don't shake near as bad as the Victor did either. It cost more, but to me, definitely worth it. Great desk! Very sturdy monitor mounts and fits my space. Couldn’t be happier with this workstation. Goes up and down easy, sturdy and functions beautifully! Being able to stand up for part of the day has taken away a lot of the back pain I was having.